Big names in the boxing world are descending on Brooklyn, New York, this weekend with three fighters all looking to make a name for themselves or adding a title to their collection. Former four-division champion Adrien Broner headlines the card at the Barclays Center (Showtime, 9 p.m. ET) in a catchweight main event against Jessie Vargas. Meanwhile, red-hot middleweight Jermall Charlo and fellow unbeaten junior lightweight Gervonta Davis will compete in title bouts under the Premier Boxing Champions banner. To tie it all together, the three marquee names have been beefing in the weeks leading up as well as during fight week with Jermall's brother, Jermell, joining in the fray. Let's take a closer look at what's at stake in each fight, including a prediction of who comes out on top. You can call him "The Problem," "AB" or even "The Can Man," but Broner is finally out of chances when it comes to proving that he's worthy of inclusion among the elites at 140 and 147 pounds. His one-sided and occasionally lifeless loss to Mikey Garcia last July removed any remaining doubt that Broner has the necessary intangibles to maximize his considerable talent. Yet for all of the trouble he causes outside the ring, Broner is still just 28, and along with being a consistent ratings draw due to his often outlandish behavior, hasn't faded to the point where he should be considered nothing but a joke. Not only has Broner never been stopped, his only losses have come against elite competition in performances where one could question whether the preparation and focus were ever at optimum level. Broner can save us the predictable pre-fight babble about how he's finally turned his complete focus towards his career. Even with a change in trainers ahead of Saturday's fight (dropping Mike Stafford in favor of Kevin Cunningham), it's difficult to ever take Broner seriously. But because of his undeniable talent, Broner still needs to be considered a favorite to beat average-to-very good opponents, even if he has yet to defeat a great one despite claiming world titles in four weight classes. The question for Vargas, 28, a former 147-pound titleholder, is whether he is truly anything more than just a good fighter. Like Broner, Vargas has lost each time he has stepped up to the elite level -- in title bouts against Timothy Bradley Jr. and Manny Pacquiao -- and is trying to prove whether he's a high-class opponent at welterweight or a true player in the mix. Prediction: It's hard to guess whether one fighter will benefit more from the 144-pound catchweight as both have floated back and forth in recent years between the two surrounding divisions. Still, if there's one fighter who badly needs a victory more, it's Broner, who looks to avoid back-to-back defeats for the first time in his career (at a time when the constant turmoil of his personal life could seriously use a positive headline). Of course, banking on Broner to take a fight seriously is no sure bet. But with a new trainer in Cunningham -- known for his no-nonsense approach behind the likes of Devon Alexander and Cory Spinks -- this might be the best chance to see Broner put his best foot forward, especially at a time when many are counting him out by default. Vargas is a smart boxer with a sneaky right hand in terms of power, which is something both Bradley and current 154-pound titleholder Sadam Ali found out the hard way. But he's simply neither as athletic nor skilled as Broner. As long as Cunningham can get his fighter to focus more on boxing than standing at close range in hopes of landing heavy counter shots, Broner should have enough to earn a decision. The key, however, will be activity and leaving no doubt on the scorecards, which is something historically he has struggled with thanks to his stubborn nature. Pick: Broner via UD12. There's a lot to like in terms of potential action in this matchup, which was rescheduled from March 3 after a rib injury suffered by Centeno. But make no mistake -- this is Charlo's chance to prove he's the 160-pound monster he says he is, and a future hazard to the likes of division kings Canelo Alvarez, Gennady Glolovkin and Daniel Jacobs. Charlo, 27, the twin brother of junior middleweight titleholder Jermell, presents the perfect combination of speed, power and explosion. He also packs a nasty scowl and disposition, which has helped him become a scary knockout threat. Prediction: While Centeno, 27, has proven to be a game and hungry fighter despite a 2016 knockout loss to Maciej Sulecki, he has never faced anyone the caliber of Charlo. Expect fireworks in this one between two exciting punchers, but also expect it to be a short outing. Pick: Charlo via KO3. 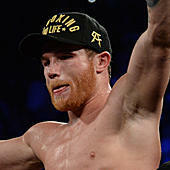 Davis, nicknamed "Tank," has looked dominant throughout his recent run as the much-hyped and Floyd Mayweather-approved "next great fighter" in the sport. The hard-hitting southpaw does get his first chance to bounce back from some adversity, however, coming off a disappointing victory last August on the Mayweather-Conor McGregor undercard. Although the 23-year-old was able to stop unheralded Francisco Fonseca, he was largely booed throughout a flashy yet inconsistent performance. Even worse, Davis forfeited his IBF title on the scales by not making weight. With his focus back ahead of Saturday's title bout, Davis will face a dangerous slugger in the fellow southpaw Cuellar, who hasn't fought since looking human in a decision loss to Abner Mares in December 2016.The native of Argentina also moves back up to a division he hasn't campaigned full time at in almost a decade. Prediction: While both fighters can certainly bang, Davis' advantages in speed and movement should be what ultimately separates the two. That's not to suggest that Davis, who has gone the distance just once in a six-round bout against German Meraz in 2014, will need to rely exclusively on boxing. As long as Davis doesn't get too brave in standing directly in front of Cuellar too long, sniping in and out while avoiding heavy counter fire from Cuellar likely presents his best blueprint toward victory. Cuellar certainly has been durable, having only been stopped by Oscar Escandon in 2011, but Davis represents that next-level fighter ready to back up Mayweather's loud claims that he's the best in the world and ready for the likes of pound-for-pound king Vasyl Lomachenko. Pick: Davis via TKO10.